Basseterre, St. Kitts, 20thJuly, 2016 – The Caribbean Football Union (CFU)Under-17 football competition comes to Warner Park, as teams compete in Group 1 matches between July 20 and July 24. Four of the Caribbean’s top football teams will begin their campaign in St. Kitts from Wednesday, (20th July), as the 2016 CFU Under 17 Qualifier Group matches kick off across the region. St. Kitts and Nevis is playing host to Cuba, Barbados and Dominica at the Warner Park Stadium, located in the heart of the Kittitian capital, Basseterre. Officials for the governing body for the sport in St. Kitts and Nevis are attaching great importance to the tournament and have made known that they are expecting much from the home team. In the opening match which is slated for 4:30pm, Dominica and Cuba will meet each other while the other game of the double header will see Barbados meeting St. Kitts and Nevis at 7:00pm. Matches will also be played on Friday 22nd and Sunday 24th with double headers each day. The St. Kitts and Nevis team has been observed in intense practice sessions as they prepare for their three encounters. A senior association official recently commended the local U-17 team for its recent performances, saying that a “good show” is expected from the squad. The official however reminded that the team would better perform if the local football fans turn out to provide their support for all match days. In the other matches to come, Cuba plays Barbados at 4:30pm and St. Kitts and Nevis takes on Dominica at 7:00pm on Friday, 22nd; while on Sunday 24th, Barbados and Dominica will feature in the early game at 4:30, paving the way for the big match-up between powerhouse Cuba and the Sugar Boyz, St. Kitts and Nevis at 7:30pm. These matches all form part of the games in Group 1 of the tournament. There will also be Group matches starting today in Guadeloupe, (Group 5), featuring that island and St. Martin, Dominican Republic, and Curacao. It will be the same over in the Cayman Islands (Group 2), from today, as the home team there does battle in coming days against Haiti, Aruba and Puerto Rico. Down in St. Vincent & the Grenadines, where Group 3 matches are being hosted, that country will be seeking to get past rivals Grenada, Bermuda and St. Lucia. The teams in Group 4 will include the United States Virgin Islands, Jamaica, Antigua & Barbuda and Guyana. Those matches were scheduled for 15th-19th July. 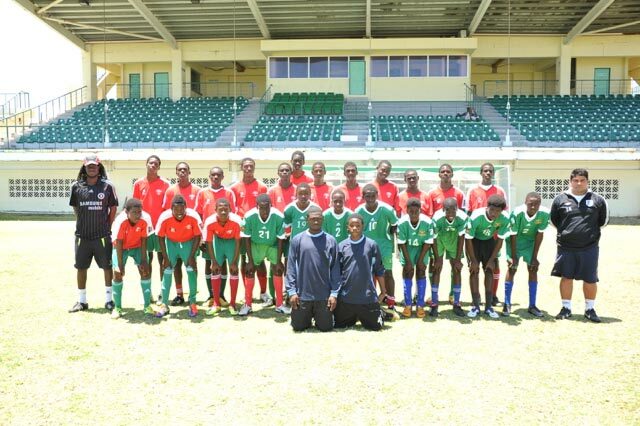 Suriname is hosting Group 6 vying against teams from Bahamas, Anguilla and the British Virgin Islands. They too are playing during the period 20th-24th July, with the opening game at 2:30pm on Wednesday. The Final Round will see the teams in two Groups with the top countries meeting in the Finals from 23rd-25th September this year. The teams are hoping to advance to the CONCACAF Men’s U-17 Championship in 2017.